We like the CSA model because it provides a direct, human connection between farmers and their consumers. 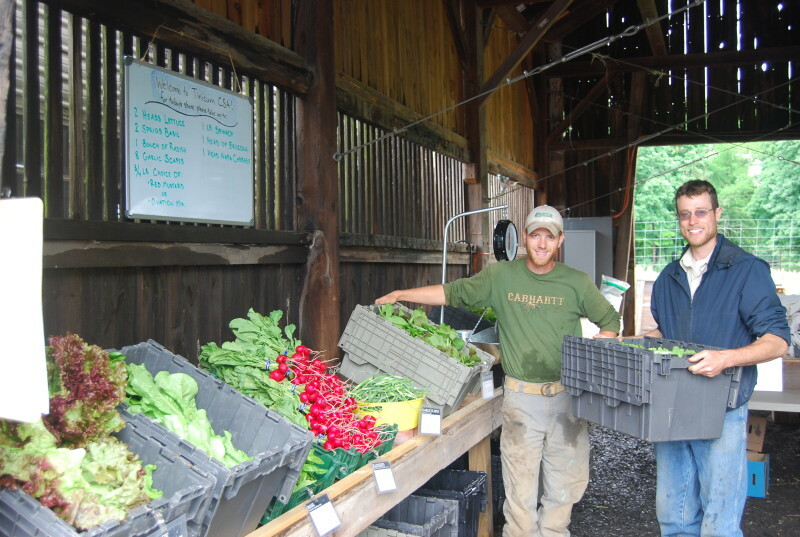 Since all our pick-ups happen here at the farm, all our members get to meet their farm and their farmers face-to-face. Our members really know where their food comes from and who grew it. For each head of lettuce you pick up from us, you know that either John harvested it or Stefan harvested it. 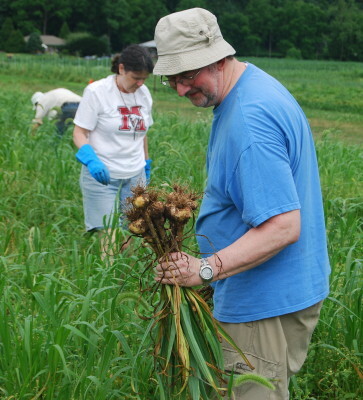 (Or maybe one of our superb volunteers harvested it.) 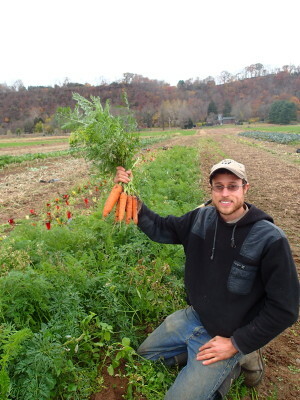 You can picture the face of the person who planted, harvested, and washed each vegetable you receive from us. There’s a human connection here. When John and I apprenticed at Sisters Hill Farm, we boxed a few dozen shares each Tuesday to be distributed at a college in the Bronx. That was alright. People in the Bronx need fresh, regionally-grown produce, too … but speaking from a purely personal perspective, it was a lot less fun and a lot less meaningful to grow for those members — whom I mostly never met — than it was to grow for the members who picked up on the farm. We believe there is something indispensably important about the personal connection that happens at a traditional CSA farm such as ours. It makes our work more meaningful. It adds a history and a community to your dining. Moreover, it permeates our production process with an inherent personal accountability. Anything you want to know about our growing methods, you can ask us face-to-face. You can see the fields and preview your vegetables as they grow. You can drop by anytime during our working hours and check on what we’re doing. This allows you to really trust our work. And we can picture many of your faces while we harvest. We think of Kim when we harvest bok choy because we know she loves it, and when I form a turnip bunch in my hand, I know that Larry is a particular fan. Given this kind of personal connection, I know that I can only offer you something at distribution time that I’d be proud to eat myself. Incidentally, this is one of the main reasons that we are not seeking certified organic status. Don’t get me wrong: I am very grateful that the U.S. has a national organic certification program, and I think organic certification has a valuable role to play in our nationwide food production systems. At the same time, I’m very glad that our business does not need a third-party certifying organization to vouch for our methods or the “goodness” of our growing techniques. We have something better: We have a direct, human relationship with each of our members. We have actual trust, and we don’t need to pay an outside party to offer their logo and bureaucracy as a substitute for the organic human trust that’s built right into our farm. Direct, human connection — it’s one thing we like about the Community Supported Agriculture model. It feels good to know that many of you appreciate it, too.